I've been on a major organization and efficiency binge this past couple of weeks which has resulted in all my past and present photos being neatly organized, and at least thrice backed up. I am using the iPad more and more to download photos from my camera with, and update my main website blog with via BlogTouch. I was using the Blogger App for that, but switched to BlogTouch because it offers a much richer editing environment. Once I settled on the apps that I wanted to use for those projects, it was time to get rid of the others I had tried, but found lacking. Then it was time to do a general ruthless cleanup of older apps I no longer use. I admit I am as bad as a lot of people when it comes to trying out new apps and games. Especially if those apps and games are free. As I was ruthlessly going through some of the older apps on my iPad I found myself wondering at times, "WTF was I thinking when I downloaded that?" Fortunately, I have better sense than to waste time pondering what sometimes goes on in my little blonde mind, and without further ado, quickly deleted all apps that provoked that reaction in me. Then I took a hard look at what was left. Since all in App Store purchases can be easily downloaded again if I want them, I set the home screens icons to wiggling again, and hit the X on several more apps I hadn't opened in a long time. By the time I was finished, those little icons that were left were no doubt wiggling in terror beneath my ruthless finger. Right now, my trusty little iPad is lean and mean! I have those apps I use the most on my first home screen, followed a second home screen that contains a few more oft used apps, and neatly organized folders containing apps I want to keep, but don't use on a frequent basis. This allows me to switch back and forth with ease between frequently used apps, and keeps home screen clutter down to a minimum. 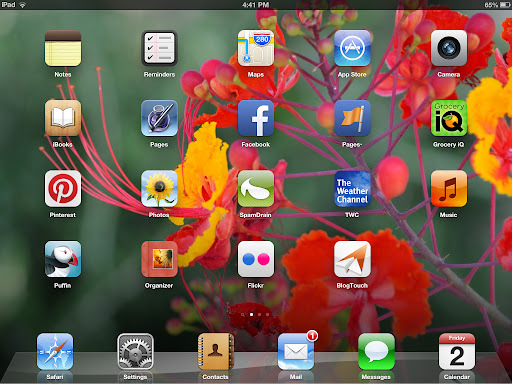 Yes, I am a little OCD when it comes to desktop and home screen clutter. The only icons on my laptop desktop belong to the Hard Disk, and two folders. When it comes to my laptop desktop, I make Monk look like a hoarder.